I’m still getting to grips with making food in advance or in bulk – to be honest I’m getting pretty good at it, but it’s the fitting it in, with Seb… my worry is when I go to work, how much time will I have for shopping, and cooking… therefore I’m getting the practice in now!! I think I’ll have it to a ‘T’ by the time I’m back at work, as Seb will be older and I will be able to send him out with his dad for the day and crack on! I’m starting to get a few ‘favourites’ together, and they are SCRUMPTIOUS!! Still missing tomatoes, and spices… but what can you do?! Eat them and suffer, or avoid them and feel capable!! I have also, this week, begun fermenting my own drinks!! Last weekend, I went to watch a friend compete in a duathalon (run, cycle, run), and at the café nearby they sold kombucha (£2.30)… it was DELISCIOUS! 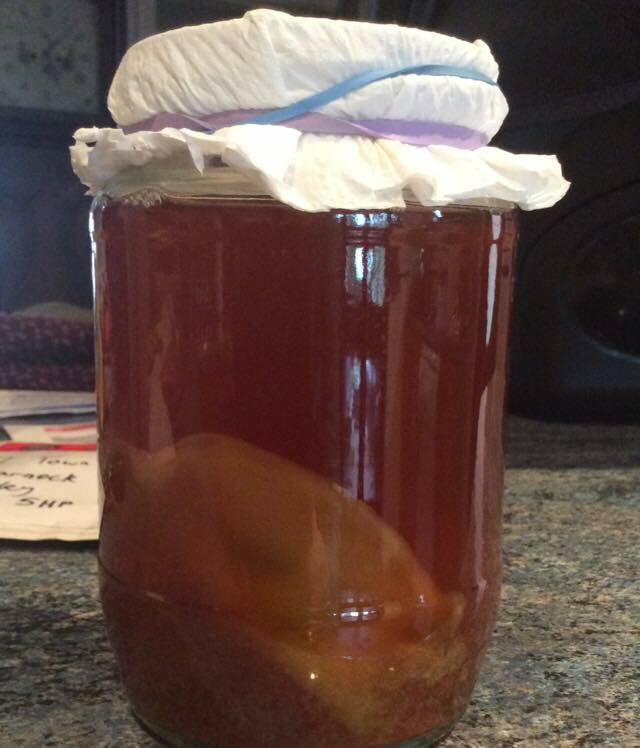 So… I hunted down a SCOBY, and got onto it… my first brew is ready to start tasting on Thursday (19th March)!! I also dug out my water kefir grains, and have finally started to rehydrate them today… so another week, plus three brewing days and I should be ready to start drinking kefir too!! Can’t wait!! I had planned to blog a couple of weeks ago before a nutritional naturopath appointment that I had… but time has got away with me, so instead of a precursor to the appointment, I will give you the summary instead! Prior to the appointment I got my GP to do some blood tests… I asked for Vit D, Mag RBC and inflammatory markers such as CRP, ESR… my GP was pretty receptive, however, they did my Mag serum, and my Vit D wasn’t back in time for the appointment!! So… not really hugely useful! Although it did throw up that I was significantly iron deficient. I also had to fill in a history sheet and food diary for one week, that aspect was easy because I still keep a detailed diary, and send it on to her. Along with these, I also sent her some questions of my own regarding supplements (magnesium, probiotics, and multi-vits) and testing (stool testing, mineral balance). 10) Add onions, mushrooms, pumpkin, squash, carrot, asparagus, avocado… not really sure why as I eat all of these in abundance!! Perhaps in the week that I sent my diary I didn’t have many? I have a few thoughts on the brands that they have recommended, and I may swap some stuff – for example the fish oil has rapeseed oil, and soya lecithin in it, amongst other things, so think I’ll change brand, probably for a cold pressed cod liver oil, when I’ve run out of this as I am working hard to eliminate those additives in my usual food. I haven’t added the flax seed yet… dubious about that due to the problems AI conditions can have with seeds, again, I may try it as an introduction at a later date, however, it is to add bulk to my stools, and since adjusting a few other things (eating pineapple, rocket, chicory etc. before a meal, avoiding drinking at meals, wakame, filtering water, supplements) my bowel movements have been much better, so why rock the boat. The advice regarding the food wasn’t hugely revolutionary. I was already doing most things, but it was a useful reminder on a few things, such as not drinking water with food, and to chew properly. Plus the information about rocket, chicory, etc. and pineapple/papaya was interesting, and does seem to have helped, plus the addition of wakame has helped get things moving too! Pretty good. I had a bit of a fall off the wagon 2 weeks ago, I just became ravenous, hungry all the time, so I started snacking… and it got ridiculous, I was snacking (only on fruit) constantly… eating our families weeks’ worth of fruit in 2 or 3 days… and ohhhh how I paid for it!! Pain EVERYWHERE!! So I have got strict with myself again, and I am (almost) only eating at meal times, and if I eat any fruit (maybe less than a cup full) it is with a meal. And hey presto, I feel so much better again. Less fatigued, less swollen, stronger!! I have also ensured I am eating lots of good fats at meal times. My pain is currently located in my right hand (dorsal aspect of the wrist – limiting middle finger extension!!! And wrist extension if my fingers are straight! ), and my left thumb. I probably don’t have full knee flexion (and a little bit of swelling is felt in either knee from day to day), but it’s getting there… and during my yoga sessions, I certainly don’t have very good range of motion anywhere compared to a year or so ago… but I’m working on it! Introductions planned… well, after my hunger surge, I spoke to a guy who is about 2 years ahead of me on this journey, and one of his first introductions that he managed to add was grass fed butter after a period of healing, and this would add some great nutrients and fats to my diet… and hopefully would make eating out a bit easier. So if this good period continues, and I keep off the fruit and snacking, then I’m going to give it a go!! Exciting!! I’m very aware that it might not work… but I feel I’m starting to feel ready for this. And if it fails, it fails, I won’t have lost much, and I’ll know more about the direction my journey is heading. So… I have my follow up with my nutritionist in April, and some plans to add butter. I’m hopefully going to have a couple of brews going of kombucha and kefir… and I will continue to be very busy with my beautiful baby!! Previous Increased knowledge leads to so many more questions!! I guess I’ll just keep reading!! Next Always on the go!! Increased knowledge leads to so many more questions!! I guess I’ll just keep reading! !